I finished my critical thesis (aka: ECE). And I submitted it. Now I await the stamp of approval from my professor so I can then submit it to the Program Director . . . to then wait for more approval. A flurry of manic activity and excruciating brainwork, and now I sit, listless, and wait. 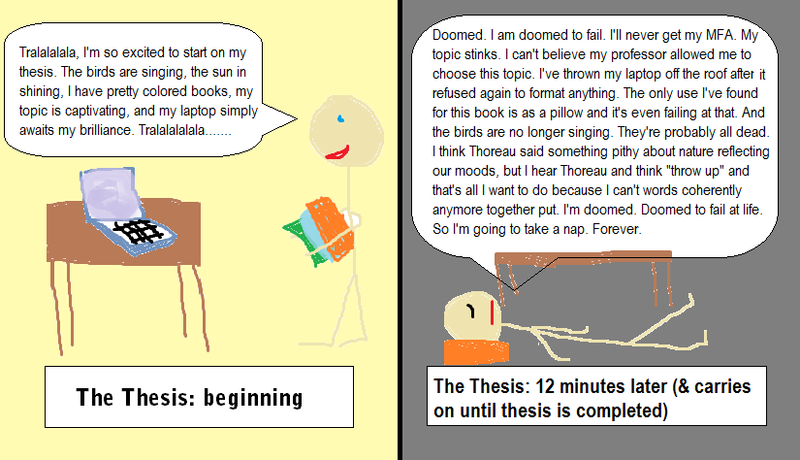 So, while waiting, I thought I'd draw you all a picture of my experience while writing this thesis. I know, I know. A weak attempt, but I can't help it. I get an absurdly childish delight in drawing these pictures. And, before you go running off to purge your eyes of my "artwork", be sure to enter our Merry Christmas Giveaway and receive a copy of A Pioneer Christmas Cookbook! I'm so happy you finished your thesis! You can add graphic artist to your list of accomplishments while you await the verdict. :D I know how you feel. Not about the thesis, but about writing in general. One day it looks pretty brilliant there on the ol' laptop, the next it looks like gibberish to me and I think I should go take a nap forever, too. While "graphic artist" probably shouldn't go under the "accomplishments" section of my resume, I appreciate your support! And I think you're right - these sentiments are true of pretty much any writer on any given day. Naps are, for me, are a perfect panacea. Thanks, Danni!